Self-evaluation samples enable organizations to evaluate the employee’s performance accurately and comprehensively. They provide varieties of a questionnaire which helps in accessing the capabilities of a person in varieties of situations. They enable the companies to decide on promoting their employees or providing increment. Various training institutions can utilize Course Evaluation Forms to evaluate their courses and schools can utilize School Evaluation Forms to get feedback about their school’s teaching methods, infrastructure, and other facilities. 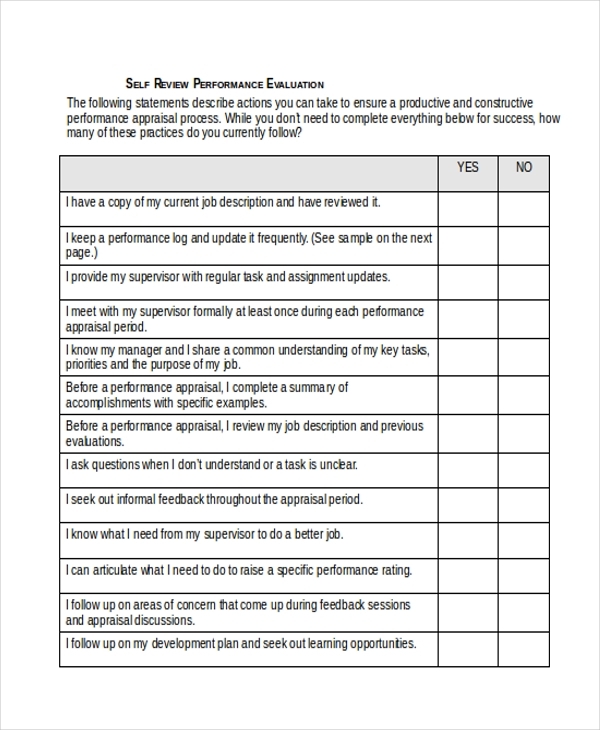 This self-review performance evaluation form presents the various statements to evaluate one’s performance. They include statements on accessing readiness, performance log, identifying and writing self-assessment as well as accomplishments and impact statement. You can also see Training Evaluation Forms. 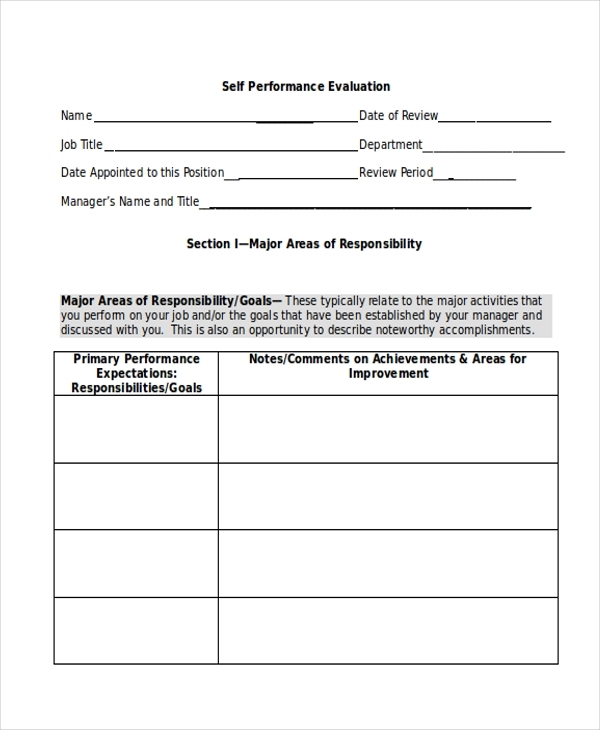 This employee self-evaluation worksheet presents the name, job title, department, date of review, supervisor, a period of evaluation and self-evaluation questions which help to gauge the employee performance. It also provides purpose and instructions for filling the form. 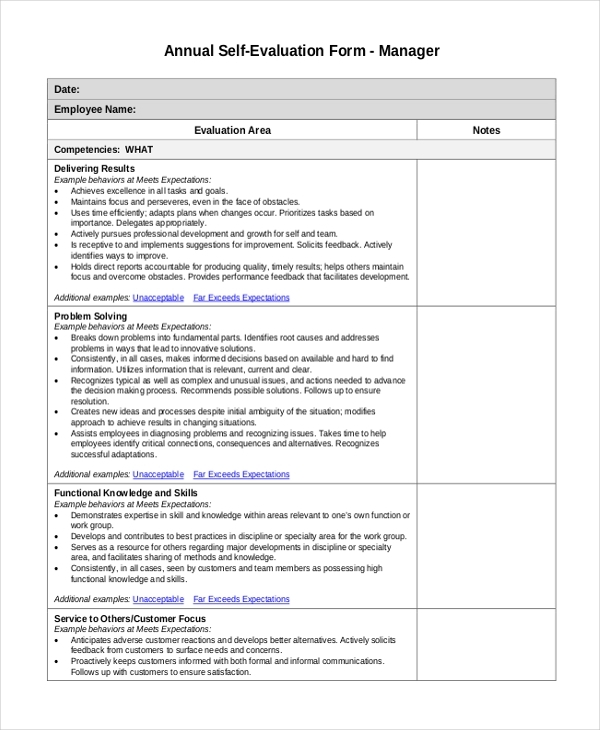 This school board evaluation form presents about ten questions to evaluate board competency. The overall grade is evaluated based on the answer given to each question which is grouped as frequently, occasionally, rarely and never. You may also see School Evaluation Forms. This self-evaluation example for students presents the name of the student, date of evaluation and field placement. 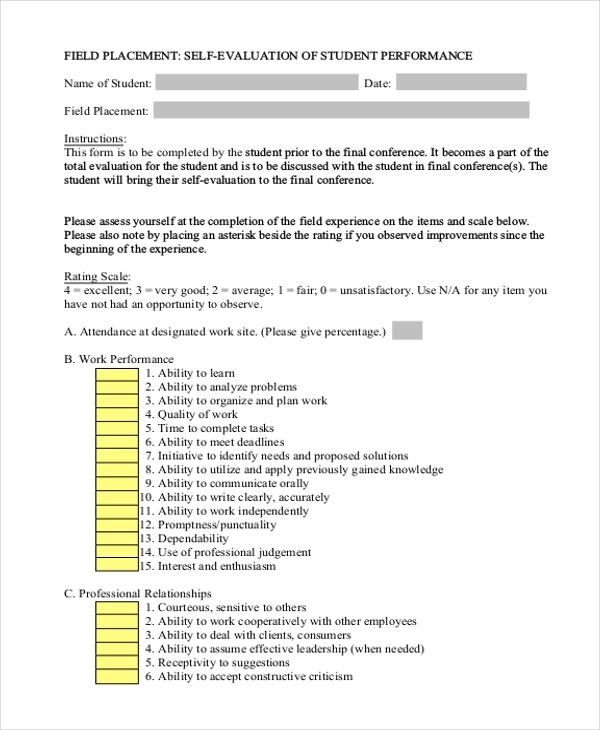 The evaluation is done based on work site attendance, work performance, professional relationship, professional role and obtains the signature from the student. 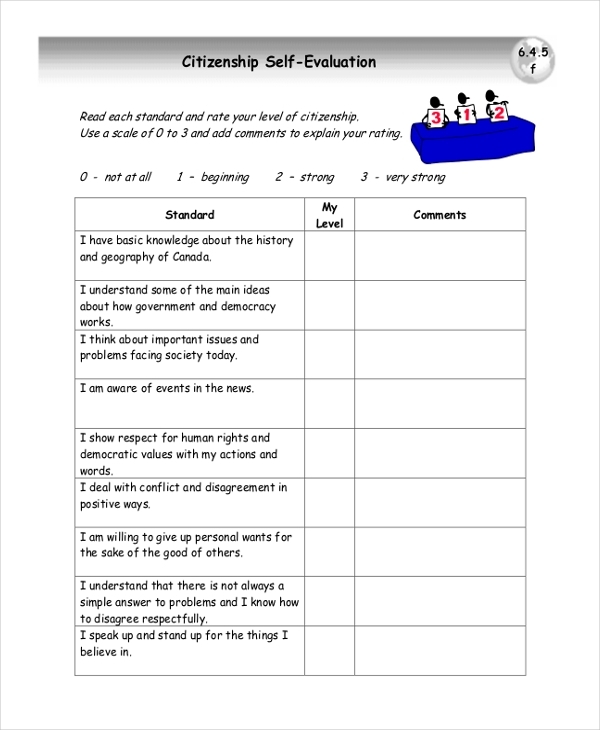 This citizenship self-evaluation form presents the standard questions and asks the citizen to enter the level of ratings like 1 for beginning, 2 for strong, etc. as well as comments to explain the ratings. This annual self-evaluation form presents the various evaluation areas for an employee like delivering results, problem-solving, function knowledge and skills, service to the customer, building trust, collaboration, communication and taking initiative. You can also see Financial Evaluation Forms. This self-performance presents the name of the employee, job title, department, review date, and review period. It also presents the major areas of responsibility, performance competencies, growth, and development plan, performance goals and expectations, knowledge, skills and abilities for business. 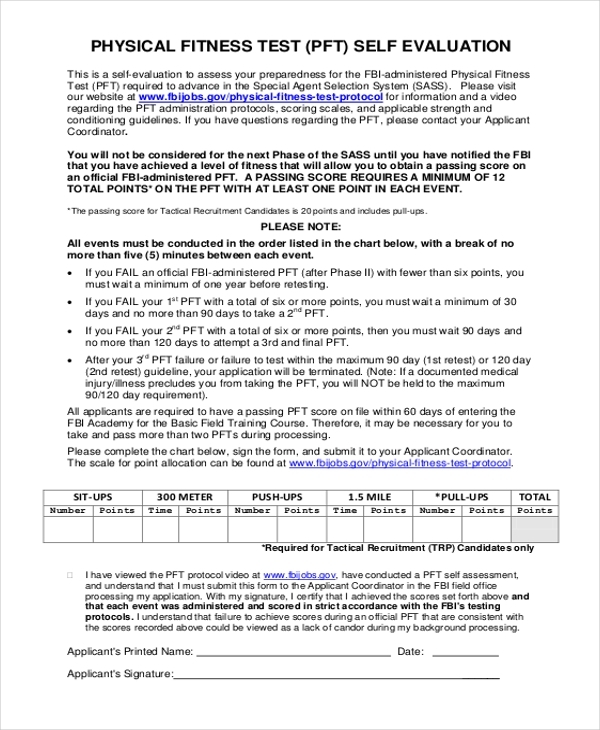 This physical fitness test self-evaluation presents the chart which contains sit-ups number and points, 300-meter time and points, push-ups number and points, 1.5-mile time and points, pull-ups number and points as well as total points. This scholar self-evaluation presents the tutor name, date and primary and secondary tutoring area. It provides various questionnaire with regards to tutoring and obtains ratings. It obtains the signature of the tutor and supervisor. What to Include in Self Evaluation Sample? Self-evaluation sample should include the entire important questionnaire that helps to evaluate the employee or student performance. They should include questionnaire regarding responsibility, employee skills, and behaviors, identifying areas for improvement, goals and expectations, communication abilities, customer orientation, teamwork capabilities, managerial capabilities, problem solving and creativity. They should also include log to measure the employee’s performance. They should also allow the employee to enter a comment for each activity and present the impact too. They should include a questionnaire to judge the employee’s strength, weakness, and scope for improving efficiency. 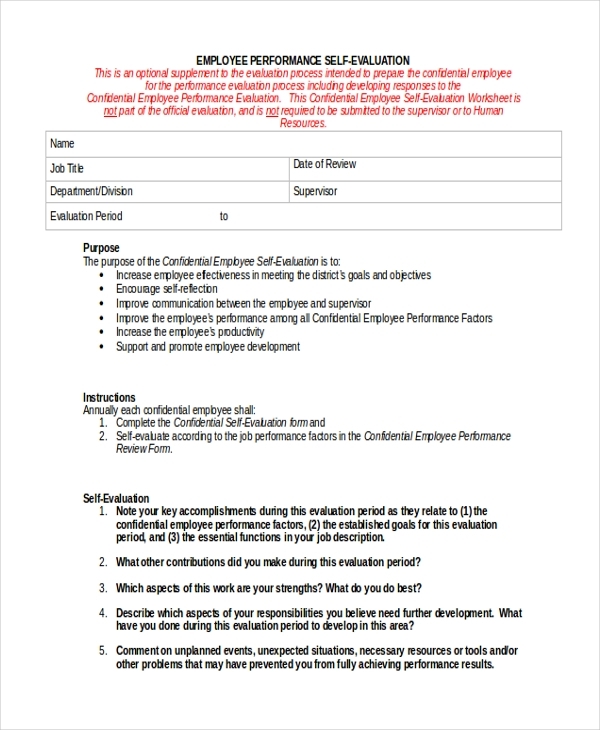 You may also see Employee Self Evaluation Forms. What are The Benefits of Self Evaluation Sample? 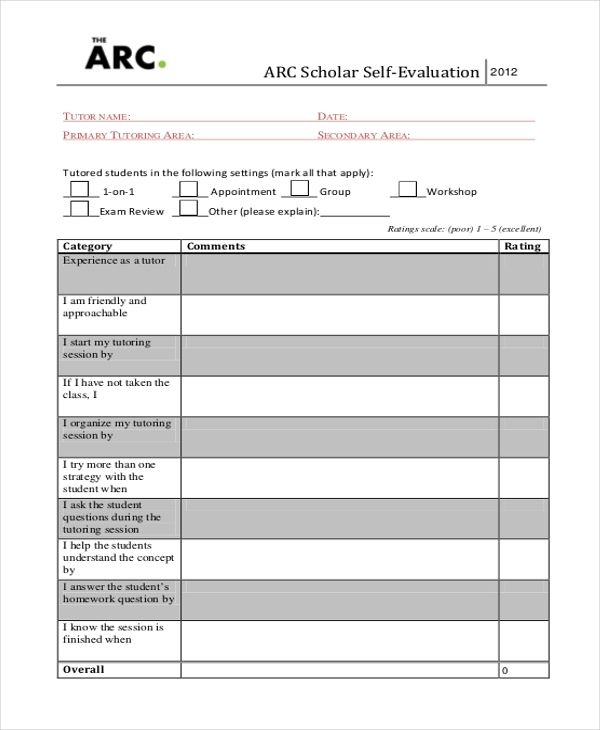 There are many varieties of self-evaluation samples available and one can easily download them from the internet. Many companies are resorting to self-evaluation forms to appraise their employees instead of using traditional evaluations. They come in printer friendly format either in PDF or word document and one can customize them easily as well. You can also see Peer Evaluation Forms.